'But the lesson of love and loss in Shoojit Sircar's poignant drama is likely to linger all year long,' says Sukanya Verma. We live in the times of apathy and desolation. We mourn and move on. It is the age of instant gratification and short-lived woe. Shoojit Sircar's October speaks to a thick-skinned audience with life-affirming simplicity. Very few films allow themselves to become the subject and the spectator. Even fewer accomplish this rare binary. But October is something of a wonder. Its lived-in melancholy and gradually attained wisdom is akin to discovering the fragrance-notes of a soft perfume. Rejecting the mainstream framework of expository storytelling and calculated pace, it attains a profundity that feels earned and uplifting. In this slice-of-hard-to-explain-attachment, Sircar's frequent ally and writer Juhi Chaturvedi delves in the dilemmas and dangers of devoting oneself unconditionally to an uncertain future and man’s infinite capacity for hope. 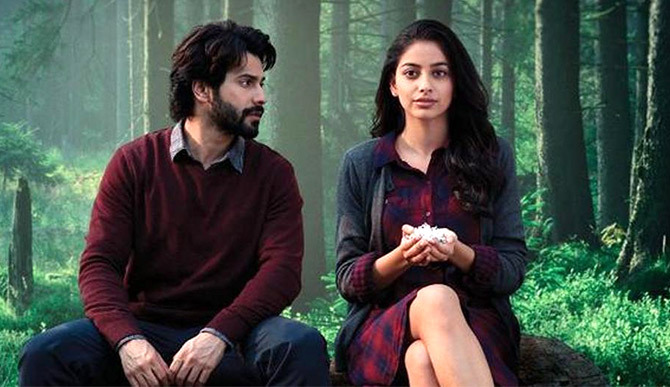 The sadness of its theme, involving a hotel management trainee's (Varun Dhawan) extraordinary concern for his comatose colleague (Banita Sandhu), is offset in Chaturvedi's fine eye for everyday details. Her matter-of-fact style imbues the gloom with a humanity and natural wit that is recognisable and relatable. Acknowledging the key to their prolific collaboration, Sircar strokes October in familiar sights, smells and sounds. Every second of his vision in a pulsating Delhi setting is like revisiting a known scenario with a refreshing insight. Bustling glimpses of the hospitality industry look beyond hectic action in the kitchen to catch a knee-high guest engage in unusual mischief. A pressure cooker of khichdi and a bottle of aachar is witness to a clumsy post-ICU visit discussion between a pair of roommates. The all too believable sparring over hospital visitor's passes, the unspoken bond of smiles and small talk created in the anticipation of a loved one's recovery. A mother's incessant role between tending to her ailing 21 year old but not forgetting about her younger two, their meals and uninterrupted study. What lends its emotional landscape distinction is Dan's (Dhawan) unexplained empathy for Shiuli (Sandhu). There is a deliberate mystery around their attachment. But the extent of transformation her freak accident brings about within Dan's moody, slacker disposition is telling of their bond even at its most inert and unspoken. No less heartening is the mild-mannered appreciation of her family comforted by his reliable presence. It is what makes his mother's disappointment at his absence all the more crushing. October plays on these dichotomies exquisitely without getting dark or judgmental. Even its most sceptical characters are products of practicality. The film's romanticised ideals are evoked in Shantanu Moitra's violin-rich theme and Avik Mukhopadhyay's photography. The latter, especially, reads the poetry of Sircar's narrative in ethereal frames capturing Delhi's dust and cold, glamour and grandeur, pretty flora and posh neighbourhoods. Varun Dhawan is its most famous face, but every single cast member is perfect in his or her part. While a soulful Banita Sandhu turns her limitation into her strength, Gitanjali Rao demonstrates maternal will beneath the furrowed face and distraught hair. Their names appear before Varun's in the opening credits, but the actor is doing most of the scene stealing. His sincerity is the first thing you notice about his performance. But what is truly impressive is how entirely it is stripped of its gallery-playing glamour. For a top box office draw, it is like being Thor without his hammer, but the young actor has his finger on Dan's purity and preoccupation. October is the month when the sweet-smelling flower, known as parijat, shiuli, harsingar, night jasmine or prajakta, enters bloom. But the lesson of love and loss in Shoojit Sircar's poignant new drama is likely to linger all year long.